MOSCOW, Jan. 30 (Xinhua) -- Venezuelan President Nicolas Maduro said he is ready to hold talks with the country's opposition with the help of international mediators, RIA Novosti reported on Wednesday. 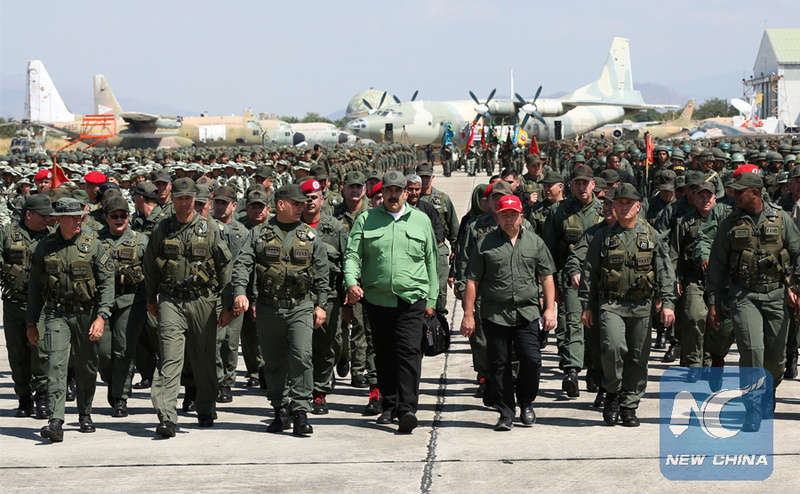 "I am ready to sit down at the negotiating table with the opposition so that we can speak for the good of Venezuela, for the sake of peace and the country's future," the Russian news agency quoted Maduro as saying in an interview. Regarding the possibility of inviting international mediators, Maduro said that "there are several governments and organizations in the world that demonstrate their sincere concern about what is happening in Venezuela. They called for dialogue." Maduro said he would welcome an early parliamentary election as a "very good form of political discussion, a solution via people's vote." But he opposes a snap presidential election as Germany, France, Britain, Spain and the Netherlands have demanded on Saturday. The countries demanded that Maduro announce a new presidential poll within eight days. The Venezuelan leader argued that he was elected less than a year ago with some 68 percent of the vote and the election was held in line with all constitutional and legal parameters. "We do not accept ultimatums or blackmail from anyone in the world. If the imperialists want new elections, let them wait until 2025," Maduro said. He believes that the Venezuelan economy is at a critical stage of recovery, overcoming obstacles and attacks on the exchange and price systems. "I am sure that if we meet and talk, there will be a completely different story," Maduro said, adding that such a meeting, however, is unlikely to happen because Trump's team will do everything to prevent it. Despite the tensions with Trump, Maduro said he still welcomes U.S. investment in oil, gas, tourism, technology, gold and diamonds. "What I asked President Putin is to maintain constant contact, provide support at the diplomatic and political levels at the United Nations and defend the truth of Venezuela internationally," he said. Maduro also praised the country's good financial relations with China and Russia, which he said will continue to develop. His country counts on strong support from China and Russia for economic development, he added. Maduro was reelected in May 2018 and was sworn in as president on Jan. 10 for another six-year term. Alleging that the Maduro administration is illegitimate, opposition leader Juan Guaido, who was head of the National Assembly, declared himself interim president during an anti-government rally on Jan. 23. The United States and Brazil have recognized Guaido's presidency, and Trump has warned that "all options are on the table."